There are lots of different ways of playing with food and these little experiments are often quite entertaining. Although usually such mischief is spontaneous, sometimes it is planned in advance. In the case of the video featured on this page, the idea presented itself just prior to Easter, which was in April, and the plan was actually carried out towards the end of June, slightly over two months later. 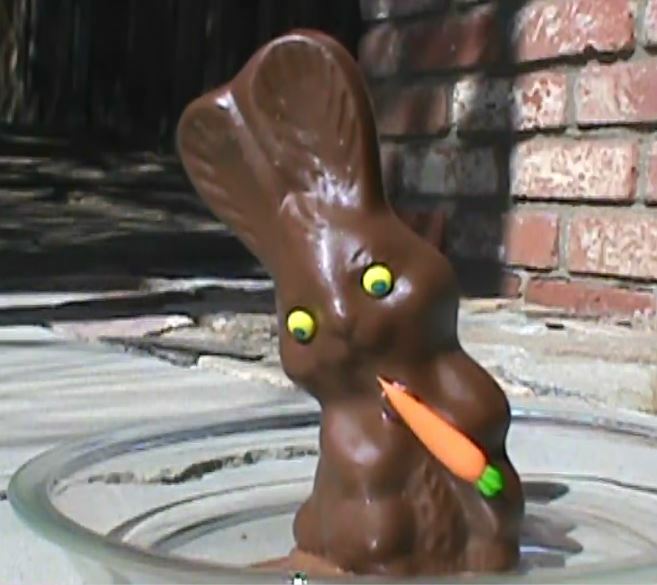 The idea was to melt a chocolate bunny in the hot desert sun. The day on which the video for this project was shot hit a high of 115 degrees on the Fahrenheit scale. The bunny melted, but it was difficult to get the bunny to stay in an upright position throughout the entire ordeal. Predictably, the bunny turned into a pool of melted chocolate after just a few minutes of exposure to the hot summer sun!